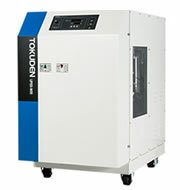 UPSS Superheated Steam Generator｜Products｜Tokuden Co., Ltd. Induction heating by transformer substantially reduces production costs. The UPSS Superheated Steam Generator can generate superheated vapor up to 700°C. It is ideal for use in drying machine parts after cleaning, baking food, sterilizing medical equipment and food containers, and recycling waste plastic. Because it employs a transformer system without a high-frequency inverter, the UPSS generator achieves high performance with more than 95% heat efficiency at an ultra-high temperature of 700°C, while substantially reducing production costs. In addition, due to its simple boiler construction with no inverter, it is easy to handle, does not require an operating license, and is not subject to regulatory restrictions.